Dancing could be a step ahead other kinds of exercise in slowing aging, neuroscientists claim in a new study. 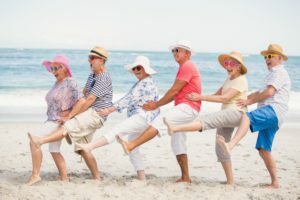 The 18-month study published in Frontiers in Human Neuroscience Journal shows promising, but limited evidence, that dancing is most effective in slowing down the brain aging process. The test group was small including 52 seniors, ages ranging from 63 to 80. They were divided into two groups. One group danced and the other did fitness and endurance training for 90 minutes twice a week for six months and once a week for an additional year. The dance lessons included changing choreography that the seniors had to memorize, including the mambo, the cha-cha and skip and hop movements. The fitness lessons featured strength, endurance and flexibility regime. Dr. Kathrin Rehfeld, the lead author of the study, said both physical activities revealed an increase in activity in the hippocampus area of the brain that normally declines over time. The hippocampus area of the brain is one of the few regions where there is the ability to generate neurons throughout a person’s life. It’s the area for memory consolidation, learning and navigation in space. Only the dancers showed improvements in other subareas of the left hippocampus and increased volume in the right hippocampus area called the subiculum. As a result of this small group, dancing appears to improve balance and brain structure in elderly. “I think dancing is a powerful tool to set new challenges for the body and mind especially in older age,” Rehfeld said. For more information on the study, check out these articles, here and here. Would you pick up dancing to ward off aging? Let us know in the comments section of Facebook! This entry was posted in Culminant Health, Exercise by Senta Scarborough. Bookmark the permalink.